The Woodhead Gemini was one of the first Gemini Formula Juniors imported into the States by The Chequered Flags USA distributor, Bill Tannenhauser of Milwaukee, Wisconsin. 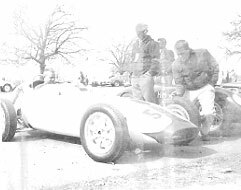 Fred Woodhead, a Dallas auto dealer and friend and fellow racer Harold Kreck travelled to Milwaukee and brought the new alloy bodied Gemini BMC Mk2 engined car back to Dallas in early 1960. They quickly painted the Gemini silver grey and sporting the racing number 15 entered in the Sebring 10th Annual Sports Car race taking place on March 23rd to 25th 1960. Kreck was to be driver but the car cooked its engine in practice so it never ran in the race. Instead they raced a hot Turner sports car with an Alexander engine. Woodhead’s Gemini 2 was next seen in the hands of Larry Haja, master mechanic and world class racer. 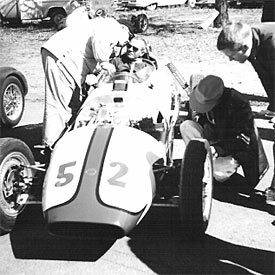 Haja’s entered the car now sporting #38 in the SunBurn Classic, Green Valley Raceway, 1961. Haja’s drove in two races that weekend. He won what was to be his first Novice Race on the Saturday. The car, though entered by Woodhead for the race on the Sunday, was instead raced by Haja’s. Again the car cooked the head gasket and DNF. Fred Woodhead took the broken car back to Dallas. 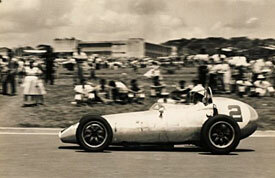 High Grammer in the replacement Gemini Mk2, Feb 1961 Green Valley Raceway, Smithfeild Texas. The suspension arches on the nose section Alfin drum brakes and flat spoke wheels show it be a latter production car. Hugh Grammer had two Gemini Mk2; The first, never to see a race track was imported directly from the Chequered Flag Factory, by passing Tannehauser the stateside distributor. 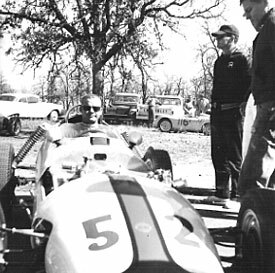 The unpainted alloy car was shipped to Houston in a crate which sustained damage on the way and upon opening the crate the Gemini was found to have been crushed with major body damage. Grammer challenged the ill fated delivery with the shipper and the Chequered Flag Engineering Company. The car was never raced by Hugh Grammer…though it was thought by his son, to have sat in his garage for years. 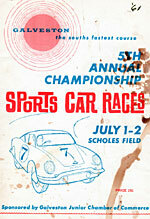 The Roundup (local SCCA rag) vol. 1 No 4..1961 featured an advertisement for a, Gemini FJ BMC powered for sale at Foreign Auto Salvage, 6301 E. Lancaster–Ft Worth, Texas. 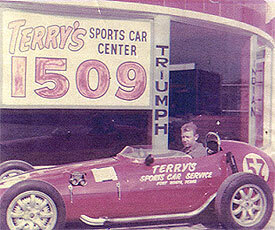 Grammer’s cabinet shop was only a few blocks from Larry Haja’s Foreign Auto Service shop . That it was at Salvage yard implies it was Grammer’s damaged Gemini but as Hajas had driven Woodheads Gemini so it could well have been Woodheads car for sale. 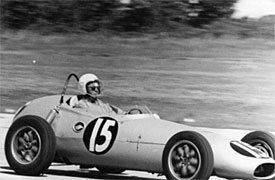 The Chequered Flag Engineering sent a second Gemini car at no cost to Grammer as recompense for the car damaged in transit. The car was however out-classed by the time it was received iin the USA. Grammer entered the white car with red stripe and black trim 3/4” around the red, in Sept 30th Oct 1st 1961 races at Green Valley Race Way. The second car sporting racing #52…. #52 was always Hugh Grammar’s racing number. The car being a later Gemini had the latter flat spoke wheel pattern and a Weber carburettor in place of the Amal or SU on earlier cars. Plated front susp. & exhaust. The front suspension was plating was done by Rich McDaniel of Overseas. 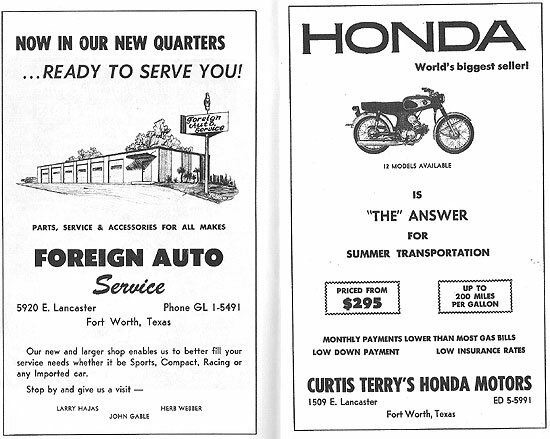 Motors Ft Worth Grammer later sold the car to Curtis Terry…. 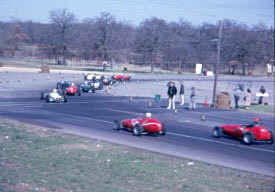 Hugh Grammer at Green Valley Raceway February 1961 leads ELVA 100 FJ and trails Huffacker BMC Mk1FJ. Terry traded latter traded the Gemini to Buzz Rowell, a college student at TCU for a Porsche SC 1600. Rowell’s family were from West Texas… Pecan farmers. It had Terry’s #52 on it and was still white/red. Run by Chequered Flag works team in the UK in 1959, the car was the first Gemini Mk2 imported by William (Bill) Tannenhauser, Milwaukee, Wisconsin – USA Distributor for The Chequered Flag in time to compete in the Sebring Formula Junior race on 10/11th Dec 1959. Joe Sheppard was behind the wheel of the polished alloycar with “Gemini Racing Team” signage. Duncan Forlong racing the ex Chequerd Flag Works Gemini Mk2 in El Salvador, now with red stripe. After the Sebring race the car was passed to Duncan Forlong who was to run the Gemini in Florida races, at Havana Cuba still with polished alloy Gemini Racing team signage and subsequently in El Salvador and then in Nassau Bahama’s, still with polished alloy but now with a Red stripe front and back but devoid of the Gemini Racing Team signage. Forlong sold the car late in 1961 to Bill Dodd in Texas. Dodd formally of Wisconsin, had moved to Oak Cliff area of Dallas. Harold Kreck remembers the car as still silver alloy or possibly Silver grey, and that Dodd later painted it red. Kreck manufactured the new upper wishbones for Dodd and remembers the car well as he was never paid. 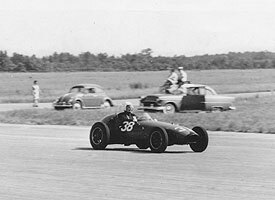 In early 1962 Lester Ford of Kilgore, Texas (RIP) traded his Austin Healy 3000 to Dodd for the Gemini which he raced at the Green valley raceway on occasions. 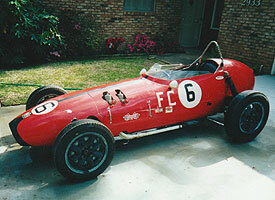 In 1964 the car was acquired by Robert “Bob” Cross of Tyler Texas. The Red Gemini now sported a black stripe in had acquired during its time with Ford. Bob Cross remembers that the car still had scratched on the firewall “Good luck for Sebring” followed by 3 or 4 initials, probably the Chequered Flag Constructors. Cross raced the car for a number of years finally laying the car up around 1990 it was acquired by Kermit O’Neil of Texa and stored awaiting restoration. In 2007 the car went to Ugo Piccalgi also of Texas and in 2008 it was acquired by Nigel Russell and Roger Herrick in New Zealand. The car has undergone a substantial restoration and is racing in NZ in the hands of Michael Sexton. JC Kilburn when selling his Cooper FJ received a fibreglass bodied Gemini car and cash from an El Paso Texas owner. Kilburn believed the Gemini came to El Paso via the West coast and if so is unlikely to be the Grammer car crushed in transit from the UK . The car was Black with a red Nose stripe (Around the nose about 6″ wide). Natural Gas” and ” Mobil Red Horse” stickers on each side of the nose- The owner of the Gemini said that he had seen my (Kilburns) cars decorated like that at the El Paso Nationals and liked it. In 1961 there was a Gemini advertised for sale by Mc Daniel, former GM of Overseas Motors. Painted Black and Red (white strip) it could well have been the car that Kilbun purchased. Kilburn remember that the seat was red, that he raced it a lot with only one engine rebuild and then sold it in late 62 or early 63. (Probably the later) to a Mr Claussen in the Phoenix Arizona area, along with a small trailer and an extra engine from his Lotus 7 along with the wheels. Many thanks to Bradley Balles Texas. Brad rounded up the Texas Gemini team ; Hugh Grammers son Dwain, Harold Kreck retired Good Year Tire Vendor and formula junior/Lotus 41 ace for Gus Hutchinson Racing back in the early 60’s in North Texas, Bob Green, Bob Cross and JC Kilburn who all helped with their contributions, memories and photos that allowed this history to be recorded. 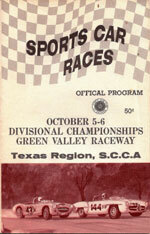 Unfortunately few race programmes are exist for the Texas FJ races that took place in period and as such few results for the FJ and Gemini. Any scanned race program or results for any Texas FJ with or without Gemini FJ involved would be much appreciated so as to move this research forward. Race results to date courtesy of various individuals in Texas mentioned and F1 Register Record book.